The Tibet related TV program I watched the other day reminded me of that in the Tibetan culture region, they present the scarf with the sincere respect for their good friends, high-ranked priests, or Buddha statues in the temples. The scarfs are long, shiny and see-through, but not for a fashion purpose. I was draped the scarf around my neck when I visited a certain company in Sichuan Province in China. 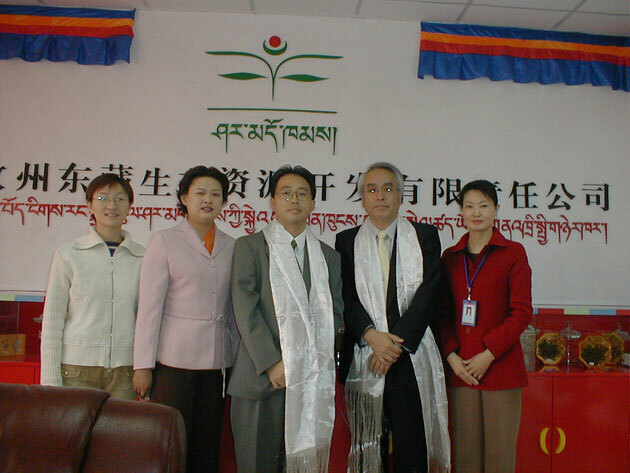 The picture taken at that time shows Tibetan language written with Chinese behind us insists their Tibetan identity.